Do non-religious people make more money? Two separate people claimed in answers and comments on Do atheists commit far fewer crimes? 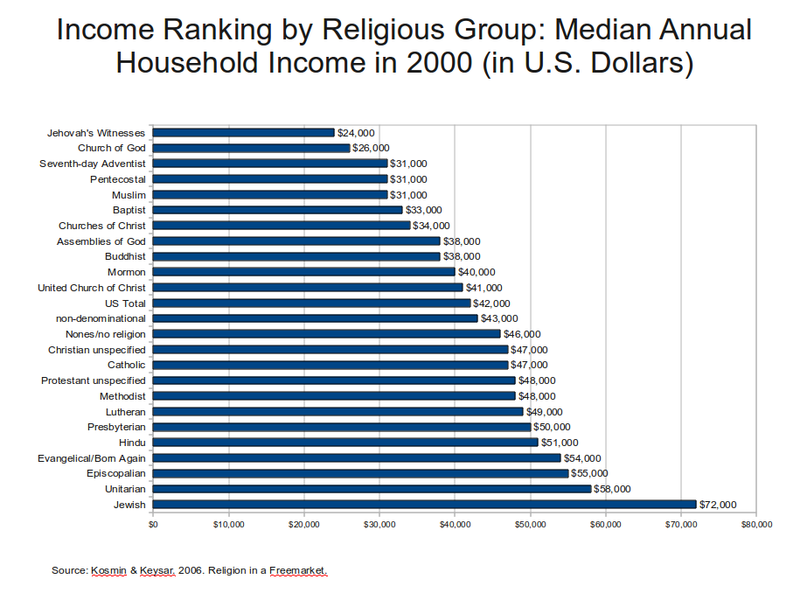 that atheists have higher income than religious people. there's a definite correllation between atheism and higher income. I in turn contested this idea by linking to Wikipedia's Wealth and Religion page, but I think it would be good to have a proper answer with proper citations. The graph on Wikipedia, from Religion in a Free Market shows non-religious people just marginally ahead of the the average. Is it true that atheists and/or non-religious people as a group earn more than religious people? DVK and Sklivvz are talking about the USA, but research from countries other than the US is welcome. I've assumed that because non-religious people involves millions of people spread over a vast geographic area means there won't be a uneven concentration of wealth to the point where income doesn't need to be considered, therefore I'm only asking about income. I think claims made by two separate notable users on skeptics.SE makes the question notable and certainly helps the internal consistency of the site. These have been done in the past, but if some rule has changed where these are no longer allowed I will research an outside notable claim. Religion is defined as "any shared set of beliefs, activities, and institutions premised upon faith in supernatural forces". There are two reasons by which religion and wealth are related. Religion affects wealth indirectly through its strong effect on processes such as educational attainment, marriage, decisions to have kids and women's decisions to work or stay home with their kids. Religion affects these behaviors and processes, and they, in turn, affect household income, expenses and saving. Religion can affect wealth directly by influencing intergenerational processes, social relations and orientations toward work and money. Intergenerational processes (the transfer of both religious ideas and wealth from parents to children) and social relations (contacts made through religious group who can provide information, capital and other resources) are important. Family processes such as family size, sibship size are likely to shape adult's wealth accumulation. For example, in explaining the unusually high levels of wealth among Jews in USA, researchers note that in addition to their high educational attainment, their low fertility contributes to wealth accumulation across the generations. Data in support that religious people are more wealthy: According to a study from 2015, Christians hold the largest amount of wealth (55% of the total world wealth), followed by Muslims (5.8%) , Hindus (3.3%) and Jewish (1.1%). According to the same study it was found that adherents under the classification no religion or other religions hold about 34.8% of the total global wealth. "An atheist is someone who doesn’t believe in God and/or finds the very concept of God meaningless or incoherent. There are somewhere between 500 million and 750 million non-believers in God worldwide." A meta analysis of 63 studies finds a reliable negative relationship between intelligence and religiosity and analytic thinking can decrease religious belief. About 38% of atheists and agnostics have an annual family income of at least $75,000, compared with 29% of the general public. Those who say their religion is “nothing in particular” line up more closely with the general public on family income levels in USA. The GDP of countries generally correlates negatively with their religiosity, i.e. the wealthier a population is the less religious it is. Statistical studies show that the poorest countries tend to be more religious. Belief in God declines in more developed countries and is concentrated in Europe in countries such as Sweden (64% nonbelievers), Denmark (48%), France (44%) and Germany (42%). In contrast, the incidence of atheism in most sub-Saharan countries is below 1%. Religions may play a more active social, moral and cultural role in those countries. "Not all countries conform neatly to the correlation between rising secularism and prosperity — Italy and Ireland, for example, are well-off First World countries where religiosity remains high, while China and Vietnam, whose regimes are officially atheist, are poor nations that are also among the most secular". North America will have the greatest proportion of people in the ultra wealthy category of the world and Europe as a region has a slightly greater wealth portion of the world of 32% than does America 31%. U.S.A is the most dysfunctional prosperous democracy overall since it is an exceptional outlier with its high level of religiosity. Statistics also show that the poorest American states tend to be the most religious and the richest tend to be the least religious. Not the answer you're looking for? Browse other questions tagged religion . Is the religious population declining? Are non-religious people smarter than religious people? Is atheism the fastest growing “religion” in the history of the United States? Are a high percentage of scientists atheist? Are atheists more generous than Christians? Are engineers more religious than average faculty? Is “No Religion” world's fastest growing religion? Do religious people score more favorably on most common social indicators than the non-religious?